Nancy Alcorn speaking at the GLOW Conference. 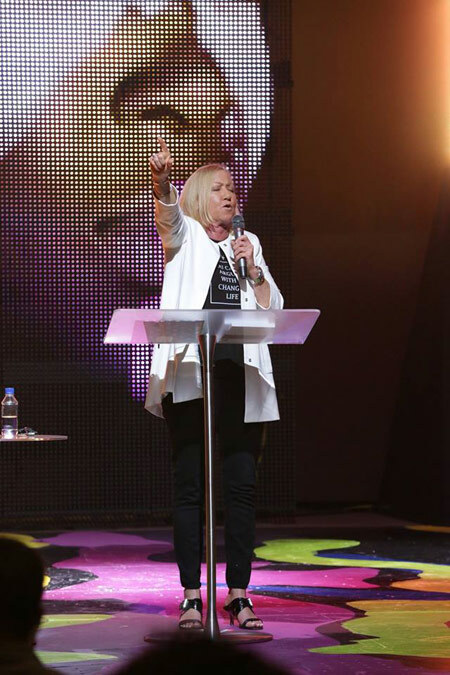 Mercy Multiplied Founder and President, Nancy Alcorn, opened the 2017 GLOW Women’s Conference with a fierce message on this year’s theme: Brave. 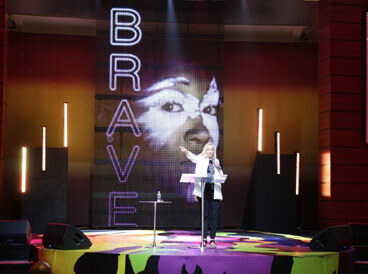 The conference, held at Calvary Revival Church in Norfolk, Virginia, is set to explore the theme “Brave” as women gather to be equipped and strengthened to contribute to the needs of society. Each year the GLOW Conference partners with House of Esther Organization. The non-profit organization was founded by Dr. B. Courtney and Pastor Janeen McBath as a transitional home that provides a safe place and holistic services for homeless single mothers and their children. “Nancy has a real heart for broken women. Her heart and passion touched me, and she helped to birth the House of Esther Organization. She is a brave single woman tearing up the devil’s ground!” said Pastor McBath. Alcorn was the opening GLOW speaker on Wednesday night and brought a powerful message to the audience. “God wants us to be carriers of freedom. In order to be a carrier of freedom, we need to be free ourselves and receive all that Jesus died for us to experience,” said Alcorn. Other keynote GLOW speakers include: Pastor Janeen McBath, DawnChere Wilkerson, Susie C. Owens, Jaine Evans, Mona Thompson, Johanne Wilson, Keisha Allen, Patrice Covington, and Latrece McKnight. Among these women are powerful leaders, sharing wisdom and encouragement to other women. Mercy Multiplied resources are available at The GLOW Conference, including shirts, books, and our Ditch the Baggage Series. Mercy Multiplied is blessed to be represented at the GLOW Conference through our Founder and President, Nancy Alcorn. To learn more about the GLOW Conference, click here.